The Sheep Whisperer: A "Boom"-ing Victory! 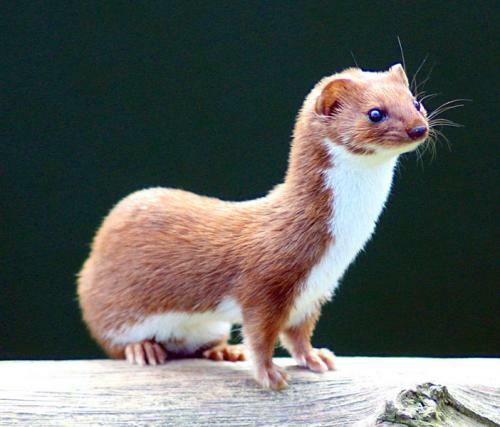 The Short Tail Weasel is an incredible example of the character trait of initiative. Webster defines Initiative as: Character Trait manifested in a readiness & ability to initiate action; an enterprising spirit; a go getting attitude; energy & drive; & get-up-and-go . The Short Tail Weasel has a high metabolic rate, requiring it to eat the equivalent of 40% of it's body weight a day! Finding prey & avoiding being prey, is an ongoing initiative. It's strong sense of smell has it tirelessly investigating all cracks & crevices, persistently pursuing until it locates its food. Here's the deal! I'm constantly on the look-out for my next meal. 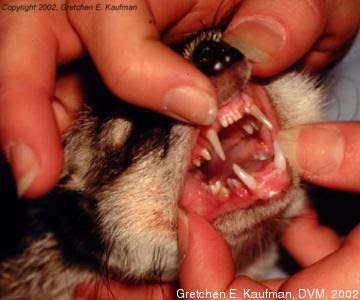 Measuring from 5-14 inches long, this 5-ounce carnivore, with its incisor teeth, is a force to be reckoned with. The weasel's speed helps it to initiate its attacks on its unsuspecting prey & predators. The weasel's stream-lined , slender body allows it to turn on a dime, positioning itself perfectly in most contests. Pouncing on its victim, it bites with the intent of piercing the base of its prey's skull. Once its teeth are in place, this power-packed mammal does not let go, no matter what size the prey is! "I want to sever ewer vital chords "(& take a bite out of ewer day)! The weasel's lightning speed & dogged initiative is complimented by its change of coats. In summer, the weasel benefits by being hidden with a golden brown coat. In winter, a pure white coat helps camouflage it in the snow, giving it an advantage over its predators. 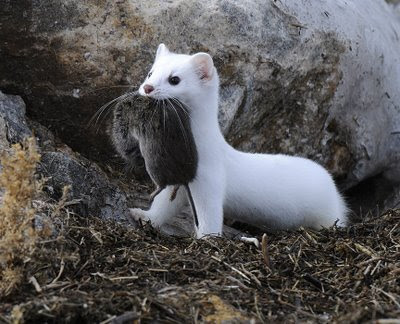 Weasels have the reputation of being one of the most efficient killing machines on earth. Small rodents & birds, Beware! Ewe could nickname me "The Exterminator"! 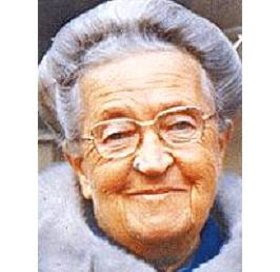 The individual I'd like to introduce to Ewe as an example of Initiative is Corrie ten Boom. Corrie was a watchmaker's daughter in Holland, in WW2 . Corrie & her family were devout Christians who provided a refuge for Jews & other Dutch resistance fugitives, hiding them from the Nazis in 1943 & 1944. They showed real creativity & initiative in keeping their "Hiding Place" a secret. I had to be very clever to hide people from the Gestapo! Corrie & her family rescued over 300 Jews & resistance workers before being betrayed. A man was pretending to need some money to bail his wife out of jail. He said that she was arrested for hiding Jews. Corrie got the money together , only to be arrested along with her family. Fortunately, the Nazis were unable to find the people that were hiding in a "secret" room hidden in Corrie's bedroom. They were able to escape safely a few days later. We were happy to hear "all the watches in your closet were safe." Corrie & her family were arrested & sent to the horrid concentration camps.where only Corrie & Willem survived. While at Ravensbruck, in Barracks 28, Corrie & Betsy initiated secret Bible studies & told many prisoners about the saving knowledge of Christ. They even learned to be thankful for the fleas in Barracks 28, which kept the guards away. Corrie wrote a book that was made into a movie. Miraculously, through a clerical error, Corrie was released from prison. She traveled from 1944-1977, speaking in 64 nations about her life experiences. In one church, she even met a converted prison guard who sought her forgiveness. God gave her the necessary grace to forgive this man that she had despised. Corrie wrote from 1977 till she died in 1979 on her 91st birthday. 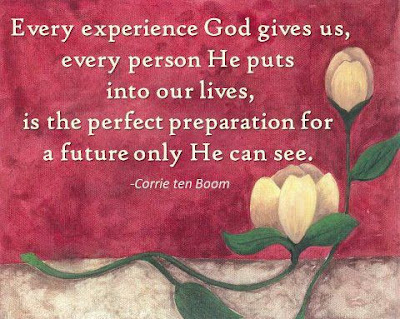 Taking her difficulties to God Helped Corrie get His perspective on life. Sheep have Shepherds that illustrate initiative in caring for the sheep. Besides the daily meeting of basic needs, the Shepherd also travels to the highlands, prior to taking the sheep up there for the summer. While there, he will prepare the pastures, removing all plants & other potentially dangerous items to the sheep. I'm helpless without my Shepherd! 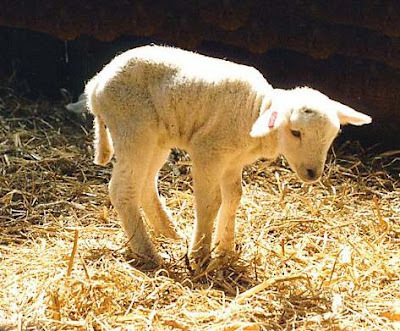 As Ewe think about ewer Good Shepherd today, be glad that His initiative led to God's blessings in ewer life! Jesus loves You!